A camel hair coat is iconic. It's one of those investment pieces that spans generations, lifestyles and geographies. While originally popularized in Great Britain, it became quintessentially American as the United States entered an era of unprecedented prosperity post WWII. 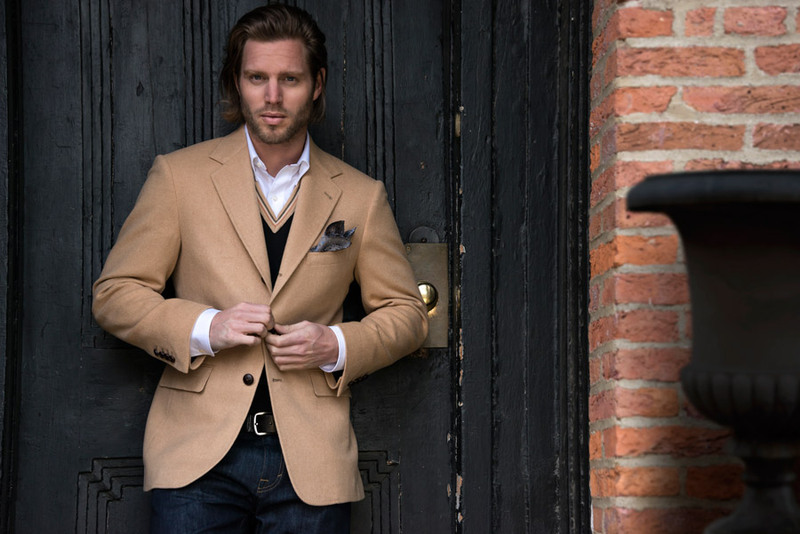 The famous and fashionable still sport camel hair coats that harken back to that classic era. However, most people don’t know that the origin of camel hair fabric actually goes back much further. Camel hair cloth is mentioned in the Bible (Matthew 3:4) and it has been used for clothing, carpets and tents for thousands of years. It was valued for its high thermostatic properties that provide insulation in the cold and heat protection in extremely hot environments such as the desert. A very resilient and durable fiber, camel hair can last a life-time, with little pillage or loss of shape and even becomes softer with age and use. The raw fiber is collected by hand from the two-humped Bactrian camel which is found across Asia. While the outer protective fur (known as guard hair) is course and inflexible, the camel’s pure undercoat is very soft and can be gathered when camels molt during the spring. Because the camels' humps help them regulate their temperature they are left unshorn for humane reasons. Fallen hair is normally gathered by hand though it may be collected by shearing or combing as well. After collection, the fine hairs are separated and washed to remove debris and dirt so they may be spun into yarn suitable for weaving. Most camel hair is blended into a recognizable golden tan though the hair can be dyed to other colors as well. The resultant cloth is luxuriously soft and usually finished with a high nap and loft. The Western world began using camel hair in garments in the 17th century and started mixing it with wool in the 19th century at the height of the British Empire. The British fashion brand, Jaeger, popularized camel hair for coats and suits. The trend reached the U.S. in the 1920s and 1930s through the sport of Polo where a casual camel coat was worn by players in between matches. A select few American textile mills began producing the fabric, and Warren Mills (now headquarters of American Woolen Company) was the premier maker. Warren Mills has been in operation in Stafford Springs, Connecticut since 1853, and it is one of the oldest continuously running textile mills in the United States. Beginning in the 1930s, the Mill gained wide acclaim for its production of high quality wool, mohair, alpaca, cashmere and camel hair fabrics. This focus on fine noble fibers enabled Warren Mills to prosper as most New England woolen mills shutdown due to tough economic conditions. Acclaimed Italian textile company, Loro Piana, purchased Warren Mills in 1988. They made a considerable investment in upgrading the equipment and facilities so that the mill could continue to produce world-class natural fiber fabrics in the United States. During the 1990s and early 2000s, Warren Mills was a “best kept secret” in the fashion industry and known to insiders as the only high end resource for noble fiber fabrics in the United States. When American Woolen Company purchased the assets of Warren Mills in June 2014, we restarted the production of camel hair and cashmere fabrics in large part due to the collective skills and knowledge of the Warren Mills workforce. We can’t imagine any other circumstance in which an American textile company could be producing these world-class fabrics in a little corner of northeastern Connecticut. ©2016 American Woolen Company, Inc. All rights reserved.